Taking your elevator interiors higher! 18 Years of Service in Florida! Architectural Entrances & Cab Interiors has been providing businesses with elevator lighting, entrance cladding, wall panel systems and flooring since 2000. 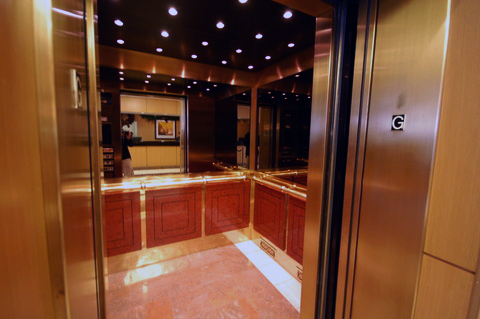 We work quickly and with exceptional craftsmanship to transform and modernize your elevators. Contact us today for an estimate or to discuss your needs with a member of our expert staff. Are your elevators worn down, dimly lit or sorely outdated? If they’re looking a little worse for the wear or are uninspiring to the people using them, it’s time to give some thought to updating, renovating and modernizing your elevator interiors in Florida. Architectural Entrances & Cab Interiors is the company for the job, providing you with comprehensive services aimed at making your elevators more appealing and accommodating. We handle everything from flooring and lighting to customized etching and cladding—whatever it takes to put a custom, updated spin on your elevators. Our professionals have been tending to the elevator interior design and modernization needs of customers throughout the state and throughout the years, we’ve come to be known as a premier resource for elevator cab remodeling in Florida. Our ability to mock up designs digitally and apply our understanding of modernization concepts allows us to provide a high level of service. We’re known for producing updated results that meet your overall facility design specifications, as well as the minor details and accents that make your elevator interior unique. We can even provide fabrication services on-site or at our facility, producing cladding and other accents that can be applied to stunning effect. We invite you to contact us today and let us breathe new life into your elevators, no matter the level of customization they demand. We have experience working in elevators spanning all major manufacturers, including Otis Elevator, Schindler Elevator, Kone Elevator and ThyssenKrupp Elevator Company. Our portfolio of completed jobs is expansive! We’ve worked in office buildings, hospitals, condominiums and industrial plants throughout the Southeast. We work quickly without compromising our quality workmanship, minimizing downtime for your elevators and delivering superior results. In addition to custom interiors, we provide specialty services such as metal cladding and manufacturing of doors and entrances. We’re ready to provide you with a free estimate on any of the renovation services we offer and can tailor our abilities around the specific needs of your elevator. From modernization to customization, there’s no better team to work on your elevator entrances and interiors! Contact us today to get a quote and learn more about our capabilities.